Affogato is a classic Italian dish of espresso poured over ice cream. Served with almond biscuits soaked in Marsala, it's one of the easiest desserts ever. 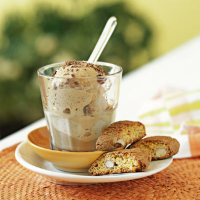 Place 2 cantuccini biscuits in each of 6 heatproof glass dessert bowls or tumblers. Pour a tablespoon of the Marsala over the cantuccini and leave to soak for 5-10 minutes. When ready to serve, remove the ice cream from the freezer and make the coffee either in a cafetiére, filter or espresso machine. Place a large scoop of the ice cream in each glass and take to the table. Just before eating, pour a little of the hot coffee over. Top with grated chocolate. As an alternative, soak Corsini Cantuccini Chocolate Chip biscuits, as above. Serve with chocolate ice cream drizzled with hot chocolate sauce (make your own by melting a 100g bar of plain chocolate in a heatproof bowl set over a pan of simmering water).